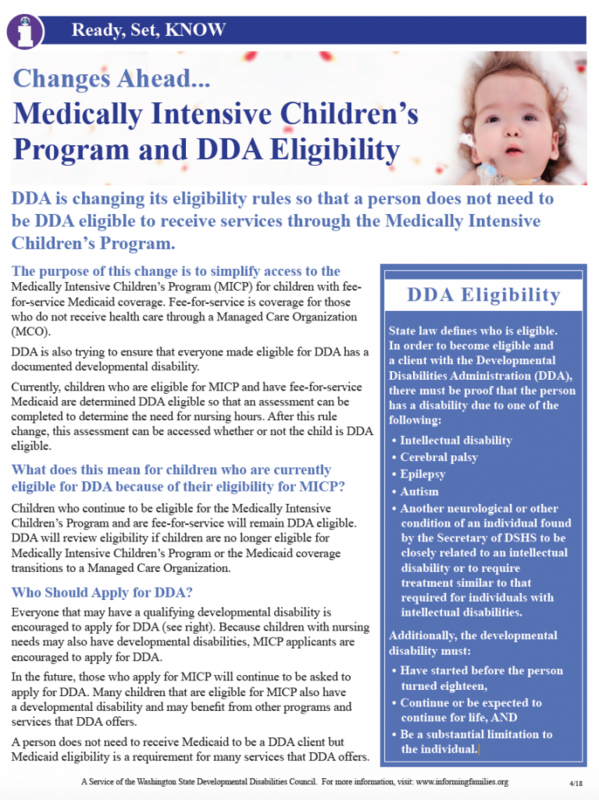 DDA is changing its eligibility rules so that a person does not need to be DDA eligible to receive services through the Medically Intensive Children’s Program. The purpose of this change is to simplify access to the Medically Intensive Children’s Program (MICP) for children with fee-for-service Medicaid coverage. Fee-for-service is coverage for those who do not receive health care through a Managed Care Organization (MCO). DDA is also trying to ensure that everyone made eligible for DDA has a documented developmental disability. Currently, children who are eligible for MICP and have fee-for-service Medicaid are determined DDA eligible so that an assessment can be completed to determine the need for nursing hours. After this rule change, this assessment can be accessed whether or not the child is DDA eligible. What does this mean for children who are currently eligible for DDA because of their eligibility for MICP? Children who continue to be eligible for the Medically Intensive Children’s Program and are fee-for-service will remain DDA eligible. DDA will review eligibility if children are no longer eligible for Medically Intensive Children’s Program or the Medicaid coverage transitions to a Managed Care Organization. Who Should Apply for DDA? Everyone that may have a qualifying developmental disability (see below) is encouraged to apply for DDA. Because children with nursing needs may also have developmental disabilities, MICP applicants are encouraged to apply for DDA. In the future, those who apply for MICP will continue to be asked to apply for DDA. Many children that are eligible for MICP also have a developmental disability and may benefit from other programs and services that DDA offers. A person does not need to receive Medicaid to be a DDA client but Medicaid eligibility is a requirement for many services that DDA offers. Another neurological or other condition of an individual found by the Secretary of DSHS to be closely related to an intellectual disability or to require treatment similar to that required for individuals with intellectual disabilities. If you have questions about this change or would like to provide feedback, contact Beth Beth Krehbiel by April 26, 2018.